We observe situation in which human computation processes leverage the abilities of people via the Web to perform complex computation. In this context human intelligence is harnessed to solve computational problems that are beyond the scope of existing Artificial Intelligence (AI) algorithms. The aim of this paper is to achieve an in-depth understanding of the influence of crowdfunding business process into Artificial Intelligence and what kind of computational problems can be efficiently answered using human computation. Wisdom of crowd has been applied successfully to a range of tasks, from translating text and marking images, collecting information to building large databases and to solve problems that are difficult for machines to solve. Presented hybrid solutions will be considered as optimization- leveraging machine intelligence to help improve the accuracy and efficiency of algorithms. Progress in information, communication and multimedia technologies and the increasing expansion and use of the internet, are generating gradual innovation in diverse areas, leading to the creation of new business processes. The innovation process is currently undergoing significant change in many industries, it very visible in Information Technology (IT) sector. Recent developments in technologies and the usage of Artificial Intelligence techniques make the IT more intelligent and provide higher-level services to its users. Therefore, building an appropriate infrastructure for intelligent agents to run around the IT performing complex actions for their users is the biggest challenge for organizations of the future (Hendler, 2001). An enormous potential exists in rich collaboration between humans and computers. Countless open computer science problems remaining in Artificial Intelligence, can be readily solved by humans with the usage of their creativity, planning abilities, visual processing, and verbal tasks (Quinn & Bederson, 2011). The new computer world has created a virtual collective intelligence- helped large groups of people connect and collaborate. According to Von Hippel a large number of users of a given technology comes up with most innovative ideas (Von Hippel, 2005). A decentralized, disorganized group of people, thinking independently can use “crowd intelligence” to make judgments and solve problems that would be very difficult to make using only one person (Surowiecki, 2005). 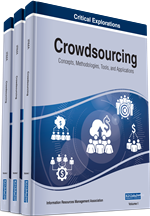 Crowdsourcing business model have had important impact into AI it has been applied to a range of tasks such as: collecting information, translating texts, annotating images, building complex software. While traditionally these tasks have been small and could be completed employees, organizations are now starting to crowdsource larger, more complex tasks to experts in their respective fields. Presented combination of crowd and computers offers another point in the tradeoff space where solutions are faster than individual human efforts due to diversity and network effects of human participation (Long Tran-Thanh, 2014). In most advance processes of artificial intelligence (AI) crowd builds large databases of common sense facts. That’s possible due to the fact humans acquire a great deal of common sense knowledge. Large databases of spread humans’ knowledge collect information into knowledge bases and ontologies using data mining. Presented process influences of recent innovations in the competitiveness of organizations (Zaidan & Callison-Burch, 2011).